Happy Monday! As much as people don’t like Mondays, I love Mondays. I know, I know, I might be in the minority BUT hear me out. Mondays are all newness and fresh possibilities. Mondays are the day when all new things are generally started like: diets, new schedules and new projects! I love Mondays because I can slack on the weekend and be like oh I’ll totally be back to an organized, good self, healthy eating person on Monday. So, you see why, Mondays are actually good and not so bad after all? 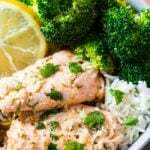 Now that we’ve established that Mondays are good, and the perfect clean slate for being organized and eating healthy, may I suggest this super simple and super delicious Garlic Butter Salmon for your dinner tonight? 1.) This Garlic Butter Salmon literally requires no prep work…well you have to chop the garlic but that’s about it. And parsley / cilantro, if you want to. 2.) There’s butter involved. Okay, so strictly speaking this is not very healthy, BUT the salmon is baked in a foil packet, and well there aren’t many other unhealthy ingredients involved in this recipe. 3.) It only takes like 15 – 20 minutes for this to be ready, and to be transferred to your rumbling stomach after a long day of whatever you – whether that’s taking care of your very active children, work, or even doing both. You rock, you! And that’s why you deserve to sit down with a plate of this delicious Garlic Butter Salmon tonight. 4.) This salmon tastes insanely delicious. It has got to be, because anything doused with butter and garlic, has to be good anyway. I mean, it’s SO GOOD, for such little prep / cooking time, that it would be a crime not to make it at least once. Served with broccoli and steamed rice on the side, it’s the perfect fulfilling meal! P.S. I’ve got a tip for you here: Make sure that you wrap up the foil really well around the salmon, so that the salmon cooks in steam and remains juicy and moist. P.P.S. For most people who know me in real life, they would know that I’m not a big fan of seafood. But things have been changing around here, and I’ve been trying to add more seafood to my diet. So for me to say something really good about anything seafood, means it has to be good. 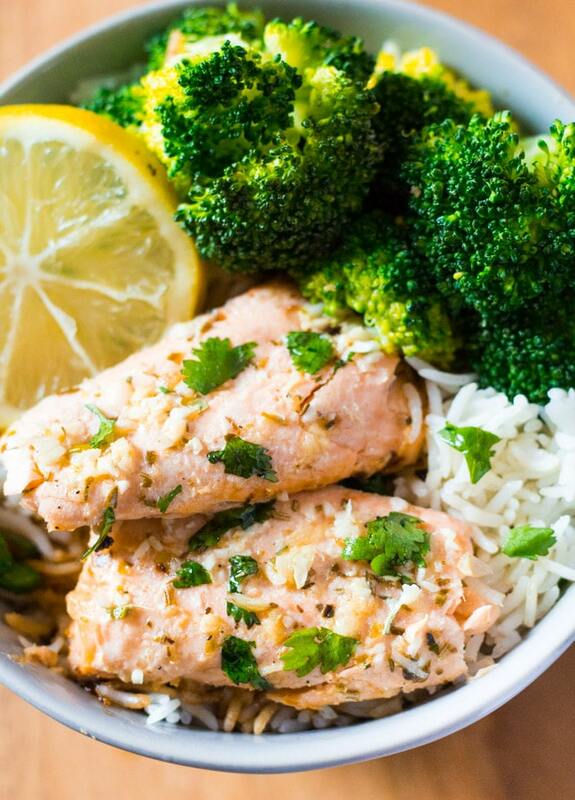 I’m totally lovin’ this Garlic Butter Salmon! A handful of pantry ingredients. And only 20 minutes of your life. Of which only 5 minutes are active prep work. Like what are you even waiting for. This is a recipe dream come true in my busy life! I gotta go now…but I hope you enjoyed this post. And if you want to read even more around my blog / get to know me better go read my first post in a new series on my blog called Friday Five. It’s lots of fun. This Garlic Butter Salmon is super easy to make, with only a handful of pantry ingredients required. Perfect for quick and delicious weeknight dinners! Preheat oven to 375 F / 190 c and prepare a baking sheet by lining it with foil. 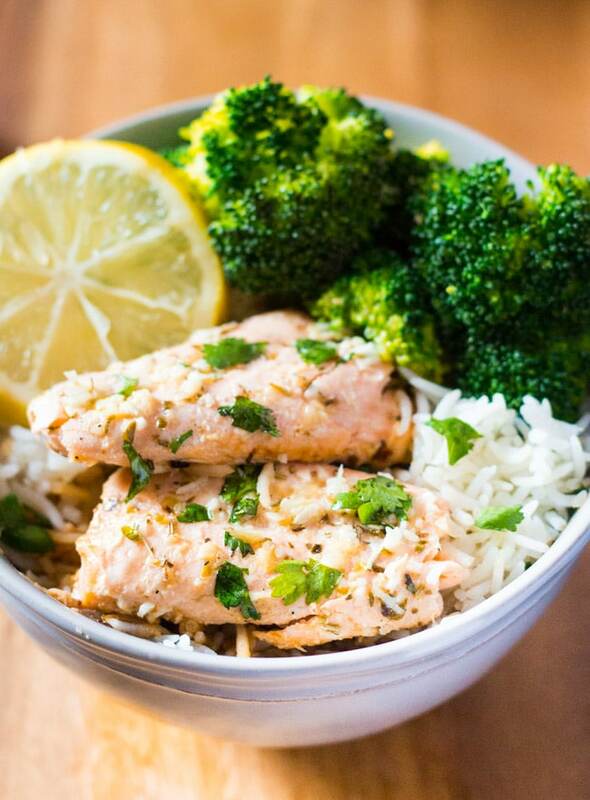 Mix all of the ingredients (except the salmon) in a bowl. Place the salmon on the foil and fold up all the sides of foil, and pour over the butter mixture on top of the salmon. Fold over the sides of the foil, covering the salmon completely and making sure it is sealed from all sides. Place into the oven and bake for about 15-20 minutes, until cooked through. Garnish with chopped cilantro or parsley, and serve immediately.